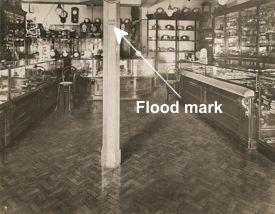 1.5m water in 1932 - undamaged. The Granwood Composition Wood Block was the result of several years' experimentation by a local builder, Mr L. P. Evans. His objective was to produce a flooring system which possessed the warmth and resilient properties of wooden floors without having the major disadvantages associated with wood, which are expansion and contraction, unequal wear plus the splitting and splintering which often come with age. The resultant product was a combination of sawdust, cement and fillers which were heavily compressed into a block shape with the desired density which was then totally saturated in linseed oil. Next, the Granwood Blocks were stacked to allow them to mature and it was found that once this had happened, the product was almost entirely free from expansion and contraction, it was fire and damp resistant, didn't allow dry rot to form, was proof against vermin and insect attack, as well as being warm, resilient and extremely durable. Mr Evans then set about promoting and selling this totally new and unique product, with the first Traditional Granwood floors being installed in approximately 1912 using Granwood Flooring Blocks which were approximately 22.86cm x 7.62cm x 2.5cm thick. During 1913 an approach was made to the county architect of Derbyshire at that time, Mr G. A. Widdows, FRIBA, and he agreed to lay a Granwood floor into one of his schools at Belper as an experiment. 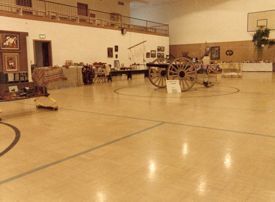 This floor was successfully installed towards the end of 1913. The intervention of the first world war stopped further progress being made but, after the war, Mr Widdows, who was very impressed with the way the "experimental" Granwood floor at the Belper school had stood up to five years of wear and tear, immediately initiated a considerable floor renewal programme throughout Derbyshire when worn, knotty and splintering wood block floors in the county's schools were replaced with new Traditional Granwood flooring. The worn out wood block flooring was removed and the new Granwood Flooring Blocks, which were by this time being made in tiles 157.2 x 52.4 x 5.88mm thick, were installed in a 1:3 cement and sand mortar bed 13mm thick. Following this acceleration of orders, the Granwood Flooring Company Limited was formed in 1921. Sales Agents were appointed in London and the UK's main provincial cities, following which the company name and product soon became very well known in principal architects' offices throughout the country. Granwood's use as a cost effective and more stable alternative to wood block flooring, particularly when used in association with under floor heating systems, became widespread, particularly within educational establishments. "Jam Factory" at West Street. This rapidly increasing demand for Granwood Flooring Blocks necessitated a move to larger and more suitable premises. This problem was solved by the purchase of a disused jam factory in West Street, Riddings which is still used as part of our factory complex today by our subsidiary, Granwax Products Limited. A long period of steady expansion followed with the name "Granwood" becoming more and more recognised as a hallmark of quality flooring throughout the British Isles. The list of contracts that the company had successfully completed was one of which they could be justifiably proud. As each year passed, the list of schools, hospitals, churches, public buildings, factories and houses within which Granwood flooring was in daily use grew extensively and there were very few towns or villages which could not boast having a Granwood floor within one of their buildings! The advent of the Second World War in 1939 dealt a paralysing blow to the company's progress. Building work all over the country was either curtailed or cancelled, with many of the Granwood staff volunteering for the armed forces and our work force being depleted further by redeployment to essential war work, plus raw materials were in very short supply. However, our remaining factory and installation teams were employed to capacity during the period of hostilities carrying out flooring work to satisfy government contracts and to provide flooring within buildings of national importance. In 1944 it became evident that further factory capacity would be required after the war and so 11 hectares of land adjacent to the existing factory but on the opposite side of Greenhill Lane, Riddings were purchased and a new purpose built factory designed and planned. 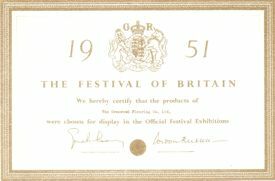 display at The Festival of Britain. Around this time, the founding directors decided to retire and so Granwood Flooring Company Limited was purchased by British Steel Constructions (Birmingham) Limited, becoming one of a group of nine companies. Mr Arthur Pass, Granwood's General Manager at the time of the takeover, was appointed Managing Director. 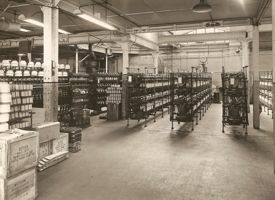 Immediately after the war, the sales and contracting departments were expanded, the planned new, purpose-built factory constructed and, once again, the company began to make steady progress. In 1955, a Canadian company was formed in Toronto with branches in five other main Canadian cities. This was the first real serious endeavour to export Granwood Flooring Blocks around the world and it met with immediate success. There quickly followed an arrangement with an American company to handle Granwood Flooring Blocks and this too proved to be a successful venture. America rapidly became the company's largest overseas market and remains so to the present day. The Canadian company was reorganised during the 60's, after which it operated as three separate companies in Edmonton, Montreal and Ontario. In the late fifties, the GPO had identified Granwood as the ideal flooring system for telephone exchanges where they required a dust free floor which would allow them to move around heavy equipment using fork lifts and yet still have the capacity to be installed to very fine tolerances of level and flatness. This resulted in Granwood floors being installed in all the major telephone exchanges throughout the UK during the next twenty years or so, a number of which were the size of several football pitches, with many of these floors still in use today. 1962 saw Granwood Flooring Company Limited merge with another local concern, Stonewood Flooring Company Limited, and the joint company was renamed Granwood-Stonewood Limited. Also in 1962, a further parcel of land adjacent to the new factory was purchased for future development. The new combined company placed additional emphasis on expanding its export business and as a result an agency agreement was signed with a French flooring contractor in 1963, with their first large contract, a convent school on the outskirts of Paris, being completed during 1964. Since then, Granwood have expanded their export markets to include all 7 continents of the world and today around a third of the factory's production is exported every year. During 1963, the complete share capital of Terradura Flooring Company Limited and Coventry Tile Company Limited was acquired by Granwood-Stonewood. The acquisition of these companies broadened the range of products manufactured and installed by Granwood-Stonewood and created a substantial flooring group, one of the UK's largest at the time. In 1969 several directors within the flooring division of British Steel Constructions (Birmingham) Limited decided to purchase the Granwood-Stonewood flooring division and began trading under the name Granwood Flooring Limited. A new parent company was formed, Granwood Holdings Limited, which was to oversee the successful development of Granwood Flooring Limited as well as industrial property development and the acquisition of specialist carpet companies. As sport within schools became a more important part of the curriculum, the reasons for Granwood's original development came to the fore again. Education authorities were seeking a floor which provided them with the warmth and appearance of timber, but without timber's well known foibles and difficult, expensive maintenance regimes, and was robust enough to be used for extra curricula activities and other outdoor shoe activities without worrying about whether their sports floor would be damaged. Granwood was found to fit the bill perfectly with its excellent tractional qualities, good and true ball response and simple and cheap maintenance requirements. During the 1970's as many local authorities added sports facilities to their schools, be they existing or new build, Granwood became the standard specification for their sports hall floors, with annual supply contracts often in place. Church of St Mary, Dunstable. 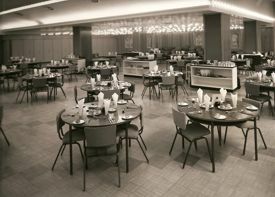 When in 1962 the first purpose built leisure centre was constructed at Bracknell, Granwood was the obvious choice for the indoor sports halls within the complex. Granwood floors were installed into the main sports hall and the ancillary hall with a Granwood floor still in regular use within the centre today. As leisure centre construction became more widespread, Granwood was the natural choice for leisure managers and specifiers as it provided them with a floor which was ideal for sport, be it played at a recreational or international level, but also allowed the "abuse" of a sports floor often demanded by the local community's use, where a sports hall will often be the largest indoor space available, for everything from social events and jumble sales through to car launches and election day counts. Leisure Centre, Derbyshire. Circa 1974. 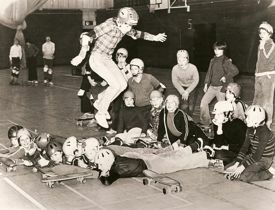 In 1976 the Ministry of Defence was required to utilise their sports halls and gymnasia for more general activities including church parades, storage of equipment etc. The physical education staff wanted a true sports floor and the quartermaster required a floor which was durable and easily cleaned. Granwood was the stand out option and so was included within scale 48 (the standard military specification for P&RTCs around the world) as a mandatory requirement. In 1989 a tri services committee carried out a wholesale review of scale 48 and, after exhausted trialling and testing, Gransprung replaced Traditional Granwood within scale 48, where it remains to the present day. There are many Granwood floors with interesting stories to tell. Bells Leisure Centre in Perth, Scotland has probably got one of the most unbelievable! 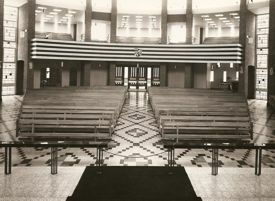 Back in 1968 as final preparations were being made to open this major new leisure complex, which had been constructed using generous donations from the famous Bells whisky family, a welder inadvertently set fire to the plastic roof which totally destroyed it causing debris raining down on the newly installed Granwood floor beneath. This Granwood floor sat exposed through two Scottish winters whilst a new roof was constructed over it. Remarkably, all that was then required was the minimal impact damage to be repaired and the whole floor area to be machine sanded and new sealer coats applied. During the early 1990's, on two separate occasions, the nearby River Dee burst its banks and placed this leisure centre under two metres of water. On the first occasion, once the water had receded, the floor was thoroughly scrubbed clean and a new seal coat applied, but all that was required on the second occasion was for the floor to be thoroughly cleaned. Incredibly, this Granwood floor is still insitu to this day. Similarly, the sports hall at Bridgemary School, Southampton was burned to the ground by one of its pupils. All that remained of the building in the end was the Granwood floor which was then used as an "outdoor" sports hall. The original intention was to rebuild the sports hall around the existing Granwood floor which would only have needed a few repairs and a reseal to return it to A1 condition. In the end, for some unknown reason, the whole school was rebuilt with, of course, a new Granwood floor in the sports hall. In 2003, after discovering it by accident, Granwood brought back to life a floor that it had laid in the 1920's within Lea Chapel, Derbyshire by just sanding it and applying new sealer coats. Indeed, this was the very chapel used by Florence Nightingale for worship during the 19th century when it was part of her family estate. This is just one example of many Granwood floors laid a long time ago which are still in daily use for which, unfortunately, the company no longer has any records. During the latter part of the 1980's, more and more of our clients were requesting a sprung version of the highly successful Granwood sports surface and so we developed Gransprung. Gransprung successfully combined the Granwood Block sports surface with a "fully sprung" area elastic undercarriage which provided users with a shock absorbent floor and centre management and schools with a sports surface they could continue to use for sport and a wide range of other money generating "outdoor shoe" activities or events. Gransprung rapidly became the preferred option within sporting environments and the UK's leading sports floor. In the mid 1980's, Granwood Flooring were invited by the Sports Council to become involved in developing their in house classifications for different sports flooring systems into a formal British Standard with all the associated test methods that would also be needed. Granwood fully supported and assisted with this work and eventually in 1990 BS7044 part 1 was published followed by BS7044 part 4 in 1991. EEC rules were demanding that a Central European Norm (CEN) was created to replace the diverse national standards which existed for sports flooring so that free trade across Europe could be achieved. Granwood have been involved in and supported this long process from the start with their personal often representing the UK's interests on the working group for indoor sports surfaces. Eventually, EN 14904:2006 �Surfaces for sports areas � Indoor surfaces for multi-sports use � Specification' was agreed and published which superseded much of BS7044-4:1991 which has now been completely withdrawn. Granwood continue to support the UK's interests in Europe. 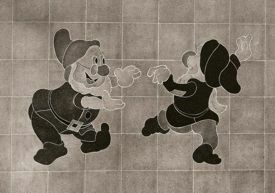 Around 1930, so as to provide the complete service to our clients, the group started to produce a range of floor maintenance materials including a variety of floor seals, wax paste and liquid polishes, cleaners and emulsion floor dressings which were designed and formulated specifically for use on the Granwood flooring systems. Over the years this operation became a separate division of the company and then in 1991 an independent company, Granwax Products Limited, was formed. This wholly owned subsidiary of Granwood Flooring Limited provides a free aftercare maintenance advice service to all Granwood floors no matter how old they are and now manufactures and markets through its own independent sales team a wide range of floors seals and cleaning products for a wide variety of different types of flooring including timber and vinyl. Having manufactured tile adhesives for many years for use by our own contracts department, a decision was taken during the late 1980's to expand the range of adhesives and grouts produced and to market them externally. This side of the business grew very rapidly and soon became an independent company, Granfix Products Limited, in 1992 and it is now one of the largest suppliers of wall and floor tile adhesives and grouts within the UK. Granwood continues to be an innovative company and yet still manages to retain the traditional values associated with its long-term family ownership. Indeed, the third generation of the Pass family is the current company Chairman and Managing Director and it is not unusual for people to retire from the company having well over 30, and even over 40, years service under their belts. We continue to supply and install our Traditional Granwood and Gransprung flooring systems throughout the United Kingdom and Ireland and to export large quantities of Granwood Blocks and associated ancillary items to many countries around the world including the USA, Hong Kong and Korea to name just three to whom deliveries were despatched from our Derbyshire factory in the last week! We look forward to celebrating the 100th anniversary of that very first floor installed using Granwood Flooring Blocks in 2012.